The U.S. Department of Energy (DOE), as the steward for U.S. energy policy, has long had principal responsibility for understanding how energy production may result in climate change and how climate change may impact energy production. During the past three decades, the Office of Biological and Environmental Research (BER) in the DOE Office of Science has sponsored programs focused on specific aspects of climate models to improve the understanding of processes represented in these models. 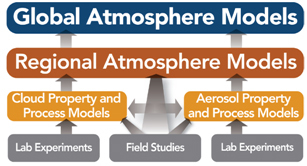 The principal observation-based DOE programs examining atmospheric processes critical for improving climate models have been the Atmospheric Radiation Measurement (ARM) Program, the Atmospheric Science Program (ASP), and the ARM Climate Research Facility (ARM Facility). Since 1990, these programs have taken coordinated and complementary approaches to quantify the effects of clouds and aerosols on the atmosphere's radiation balance. Studies by the ARM Program focused on clouds and radiative feedbacks based mainly on the long-term observational record from the heavily instrumented ARM Facility fixed sites and the ARM Mobile Facility, supplemented with periodic intensive field campaigns at these sites. In contrast, ASP research made extensive use of controlled laboratory experiments to study key atmospheric processes, especially those involving chemical reactions or composition-dependent aerosol properties, and extended these into the atmospheric environment using in situ measurements in intensive short-term field campaigns. 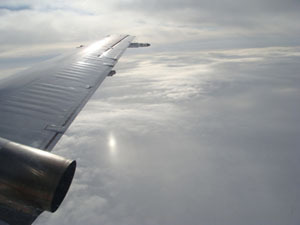 The Indirect and Semi-direct Aerosol Campaign, conducted in 2008 over the ARM site in Barrow, Alaska, obtained in situ and ground–based cloud and aerosol data for researchers to study atmospheric processes in the Arctic. A tight coupling of the ARM Facility and ASR program will allow studies of the atmospheric system in a comprehensive, end-to-end fashion, resulting in a better understanding of processes that comprise the cloud and aerosol life cycles and the interactions among them, all of which are essential to improve the accuracy of climate models. More details can be found in the ASR Science Plan.